Entrepreneurship 3 Edition Entrepreneurship: Starting and Operating A Small Business, Third Edition, demystifies the process of starting a business by presenting difficult economic, financial and business concepts in a manner easily understood by beginning business students. 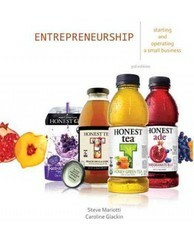 This edition is based on a proven curriculum from the Network For Teaching Entrepreneurship (NFTE) and includes new case studies, a new Honest Tea Business Plan, and more on topics such as cash flow and e-marketing. Drawing on the experience of Steve Mariotti and Caroline Glackin, students will begin building their business plan as soon as they open the text! In a step by step process students will learn how to start a small business, operate a small business and turn their ideas into viable business opportunities.